the new improved theatrical one-sheet! As a follow-up to this August entry, When "A Version" Becomes The "The Version", Ash looks to have been given the screwjob yet again on Blu-ray. Judging from these Blu-ray captures; the French Studio Canal BD features the same radically tweaked transfer as Anchor Bay's BD and Book of the Dead DVD. Way over brightened, digitally smoothed to oblivion, pastel color all the way...what every Blu-ray oughta be! I'm aware that it seems weird that picture quality would matter to a dude that still watches old analog tapes, but I expect only the best from a format such as Blu-ray capable of delivering the closest home video has ever gotten to original film negative levels of detail. There's no need to filter transfers in any fashion considering Blu-ray's sky-high bitrates, ample capacity, and continually evolving encoding methods. This and the fact Anchor Bay's now nine-year old THX DVD still blows away every release to date. 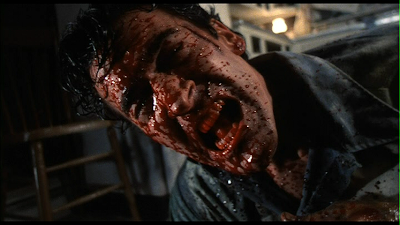 Evil Dead 2: Dead by Dawn hasn't received the treatment it deserves in 1080p, but at least the THX standard def disc (this one) is still in-print. Grab it or hell...buy another copy. 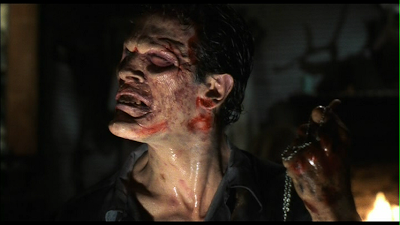 oh, i am crossed over to the dvd's and have never watched this on dvd more than once... i don't know what happened, maybe army of darkness took over, i watch that once a month.